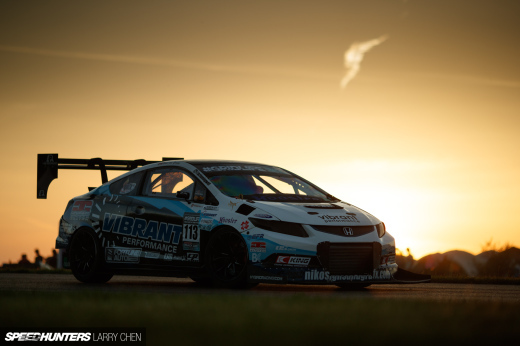 When you think about the American time attack scene, there are several popular race car platforms that come to mind. The Subaru WRX, Mitsubishi Evo and the Honda S2000 are all found often, as are Civics and Integras for the front-drive class competitors. But one of my favorite things about attending Super Lap Battle is checking out some of the more unexpected vehicles that people bring out. Take a look at this luxurious machine for example. 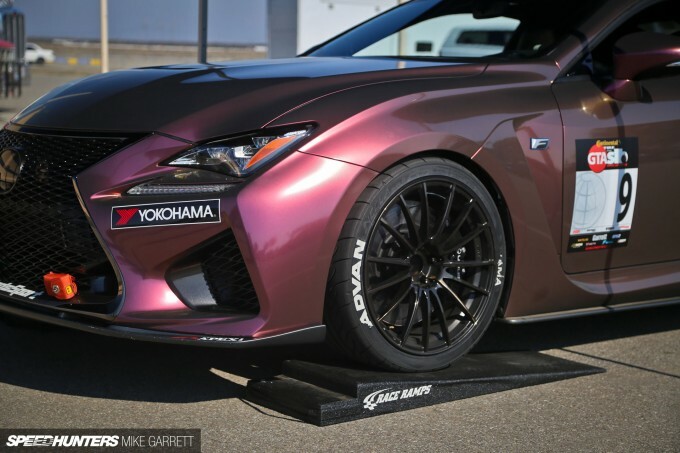 It’s a Street RWD class Lexus RC F that was being campaigned by a small contingent from Yokohama Tire and A’PEXi USA, and it certainly stood out in the paddock thanks to its show-esque color-shifting wrap. And while the Lexus was actually once destined for show duty, it now does a lot more than just look pretty. 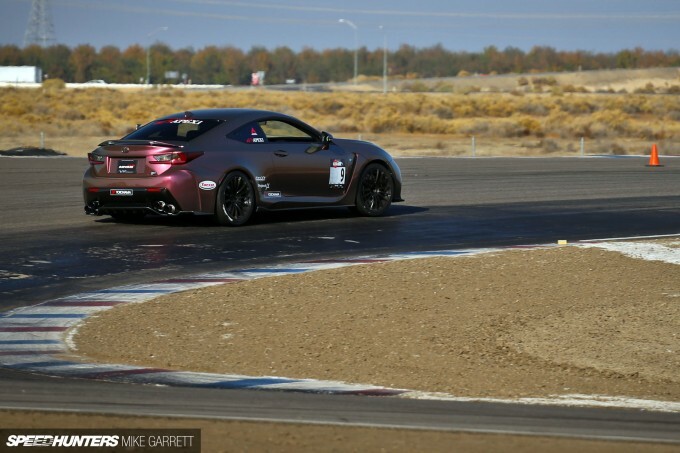 In fact, the whole idea behind entering it in this year’s Super Lap Battle event was to see what a lightly-modified, fully street-legal luxury performance car could do. The upgrades made to the RC F are minimal. There’s a an A’PEXi intake system, a trick titanium exhaust and the motor has been filled with high performance oils; but the screaming V8 is otherwise stock. Grip is also very important, so the Lexus is running 19-inch Advan Neovas on a set of Weds wheels which sit beautifully against the body. Adjustable coilovers have also been fitted to stiffen up things a bit. Inside, the rear portion of the interior has been stripped out, while a pair of full racing buckets keep the driver and passenger in place during hard cornering. Other than that it’s all showroom-stock. 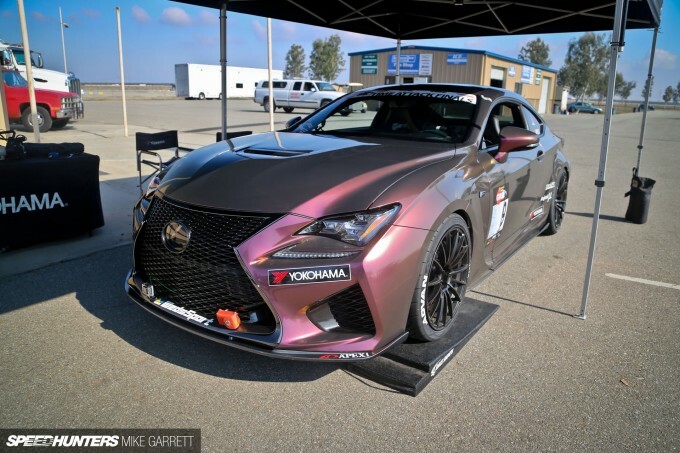 The big Lexus has to have been one of the most conservatively-modified cars running at Super Lap Battle, but it looked fantastic on the track and sounded even better. If I were fortunate enough to own an RC F, I’d likely have mine set up very similar to this one. The paint job looks a bit like the Fade knives in Counter Strike. 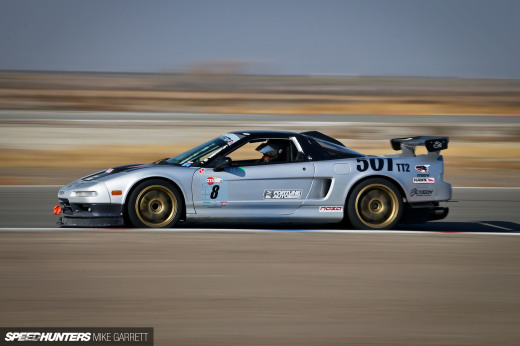 Tastefully modified, and able to perform on a track; sounds pretty damn good to me. 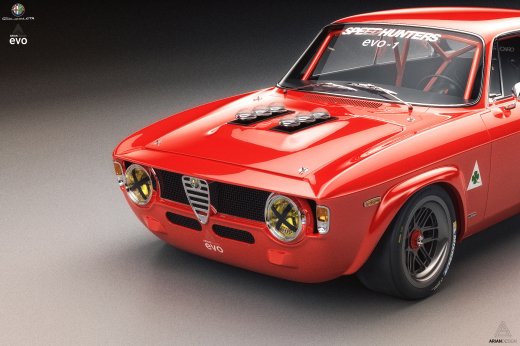 You can fit new suspension and grippy tyres but ultimately, it still needs to lose at least 500kg. Sooooo, how fast did it go? What was its best lap time? Every review and test drive I hear says these cars are not particularly good. Slow-to-shift transmissions, sloppy handling, uninspiring driving dynamics, no thanks. And we know Toyota can build a PROPER car courtesy of the LFA... Just still waiting to see that knowledge spill over into other, more affordable road cars. There's just something about Lexus and their try at luxury performance. "No cohesion" comes to mind... An idea that looked good on paper. Liked the RCF as soon as I saw it, and still do despite the negative reviews. That wrap, though, is something else. I thought it was some kind of Maziora paint at first. What wrap color is that? Also, what were the lap times?? So in stock form, performance wise, this car wasn't a show stopper. But what potential does it have? If it was turbocharged from factory it would be easier to extract more power from it with upgrades that wouldn't break the bank. $:kw ratio isn't that great for N/A, and a forced induction conversion blows can blow a budget right out. Handling? apparently its a bit of a Blimp, but I how easy is it to change this... hmm. Weight reduction can make it less street friendly, and if the chassis itself isn't that rigid, more issues. It's got a rough starting ground I think, but I hope the best for it. 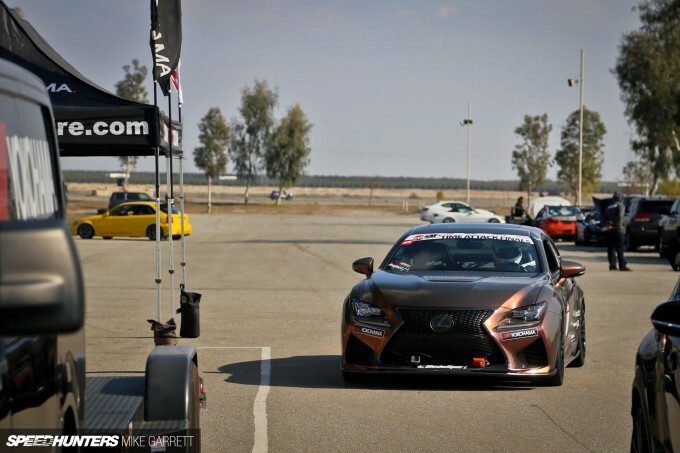 Reading what Lexus had to say about it, they seemed to think it would be a big brother to the 86 almost, they didn't want it to break records, but be a fun car. They seemed to miss the mark and the 86 is a much better base. I hope they're not discouraged though, don't want that boring non-performance inspired manufacturing period to come back again. overall machine for road and track. (including MotorWeek) in the M4. miles were under my belt, understanding how to set up the car. the track—agile, responsive, and powerful. The TVD version is a slot car. Watch this run on the Nurburgring. seconds ahead of the M4 and RS5. the Motorsport comparison of the RC F and M4 in 0-175 mph acceleration. resulting from the quirks of the car. Guess which car wins clearly 2 out of 3 runs. The RC F is a wolf in wolf's clothing. I recommend getting truly informed before you comment next time. The paint job is amazing, but the wheels... I'm sorry.. 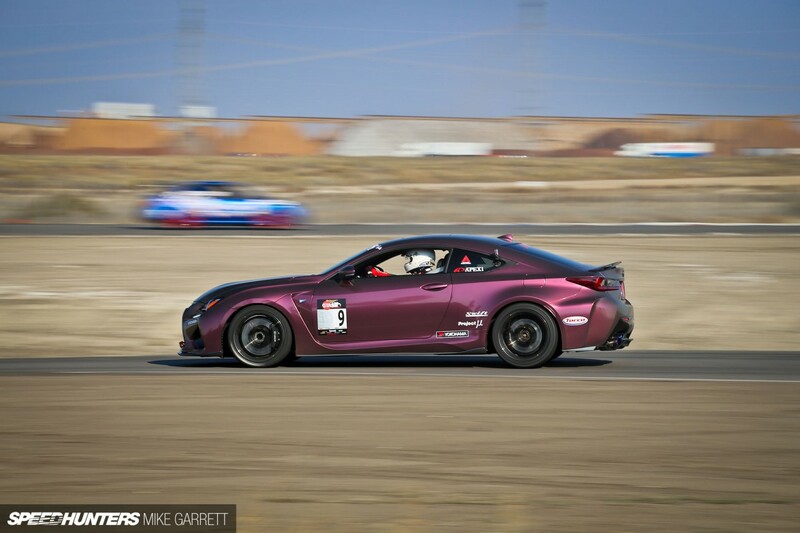 It's an RCF.. I don't think the Weds match the design of the car..
NicholasDixon Thats all wrong. Dont believe none of it bro. Sweet. I love the RCF. I saw one in person... looks like a mini supercar. Cant believe its came outta Lexus its really badass. ProDriver cool story bro... I'd still rather have an m4.. the point? who cares. i23sonny Just saying.. If you're a car guy, you wouldn't really have a hard time choosing. a BMW guy is a BMW guy.. but if you don't have loyalty to either mark, than the choice depends on what you want. If you care about pure sports performance, then the m4 is the obvious choice. If you want grand tourer with toyota reliability, and lexus comfort, go with the RCF. It's apples and oranges, really.